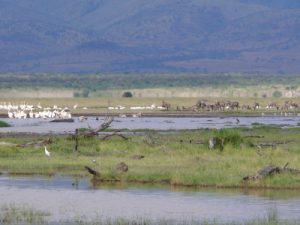 Stretching for 50km along the base of the rusty-gold 600-metre high Rift Valley escarpment, Lake Manyara is a scenic gem, with a setting extolled by Ernest Hemingway as "the loveliest I had seen in Africa". The compact game-viewing circuit through Manyara offers a virtual microcosm of the Tanzanian safari experience. From the entrance gate, the road winds through an expanse of lush jungle-like groundwater forest where hundred-strong baboon troops lounge nonchalantly along the roadside, blue monkeys scamper nimbly between the ancient mahogany trees, dainty bushbuck tread warily through the shadows, and outsized forest hornbills honk cacophonously in the high canopy. 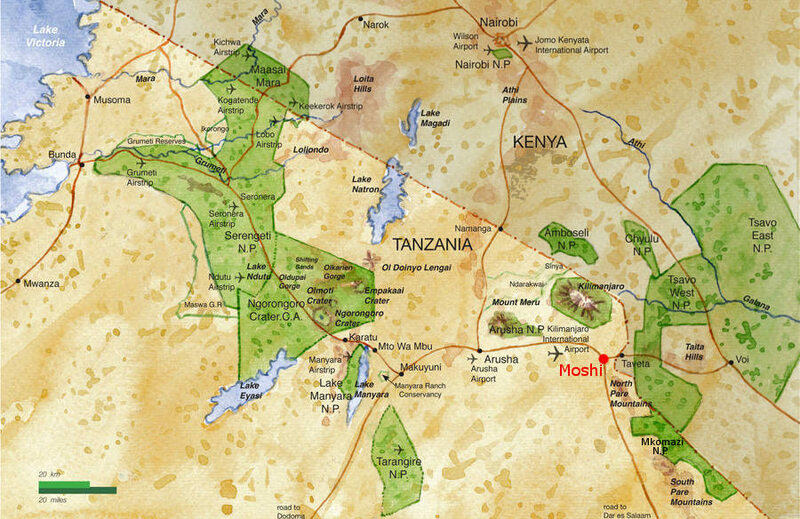 Contrasting with the intimacy of the forest is the grassy floodplain and its expansive views eastward, across the alkaline lake, to the jagged blue volcanic peaks that rise from the endless Maasai Steppes. Large buffalo, wildebeest and zebra herds congregate on these grassy plains, as do giraffes - some so dark in coloration that they appear to be black from a distance. Inland of the floodplain, a narrow belt of acacia woodland is the favoured haunt of Manyara's legendary tree-climbing lions and impressively tusked elephants. Squadrons of banded mongoose dart between the acacias, while the diminutive Kirk's dik-dik forages in their shade. Pairs of klipspringer are often seen silhouetted on the rocks above a field of searing hot springs that steams and bubbles adjacent to the lakeshore in the far south of the park. Manyara provides the perfect introduction to Tanzania's birdlife. More than 400 species have been recorded, and even a first-time visitor to Africa might reasonably expect to observe 100 of these in one day. Highlights include thousands of pink-hued flamingos on their perpetual migration, as well as other large water birds such as pelicans, cormorants and storks.